Shortly after Corey Brewer’s 51-point outing against the Houston Rockets, Ryan Feldman at ESPN Stats & Info published a post about if the Timberwolves wing is the most unlikely 50-point scorer ever. What do Michael Jordan, Allen Iverson, Rick Barry and Corey Brewer have in common? They’re the only players in NBA history with at least 50 points and six steals in a game (steals became official in 1973-74). In the last 10 games prior to his explosion versus Houston, Brewer was using 18 percent of the team’s possessions while on the floor. Adding his career night (32.6 usage) hikes that recent uptick to 20. 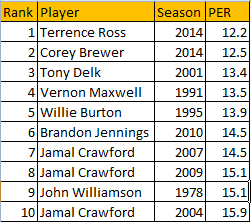 Brewer also holds the second-worst PER (bottom 10 here) of the 50-point club, one that increased .5 points overnight. He also squeaks into the bottom 20 percent when it comes to offensive rebound percentage, something that could aid in scoring. He’s also on the list of the 25 worst three-point shooting seasons ever, at least for players taking over 200 attempts, and a below-average free throw shooter at 72 percent. The Timberwolves were also without one-half of their “outlet mall” in Kevin Love while Brewer often makes up the receiving end of the fast break points. 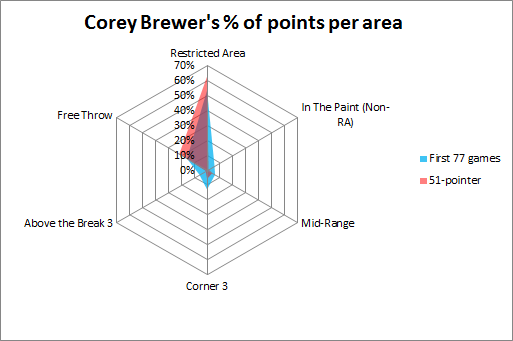 None of these obstacles got in the way of Brewer, who scored 32 points in the restricted area alone while going 2-of-6 from three-point range. As for three throws, he was 73 percent but off 15 attempts, good for 11 points from the stripe. It’s safe to say he’s one of the more unlikely 50-point scorers and hopefully those stats contribute to the discussion. 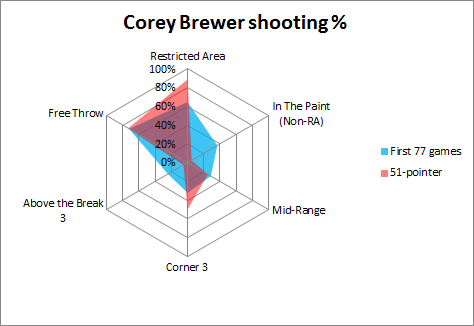 Just for fun, I wanted to compare his shooting that game to his averages in his first 77 outings so I fiddled around with a variety of graphs I’ve recently used for the highest scorers and teams, among other related posts. Edit: Percentage of points by location and shooting percentages can be found in those links. I just couldn’t help myself when it came to including yet another batch of those charts in a post. I should probably turn it down a notch. As someone in Minnesota, though, this has been quite an entertaining last month or so of the season despite the Timberwolves either basically out of playoff contention or officially eliminated. They travel to Sacramento on Sunday where they’ll play former-teammate Derrick Williams, who always seems to show up to play them, but how Brewer will bounce back from 51 points (I still can’t believe it) will obviously be exciting as well. Given how he plays, it’s possible those were the happiest 51 points ever. All stats are according to Basketball-Reference.com, save for the shooting charts. Those are according to NBA.com’s numbers.